but really, who’s the boss? thank you community for answering this question for all of us. (i refuse to spoil the show for you). 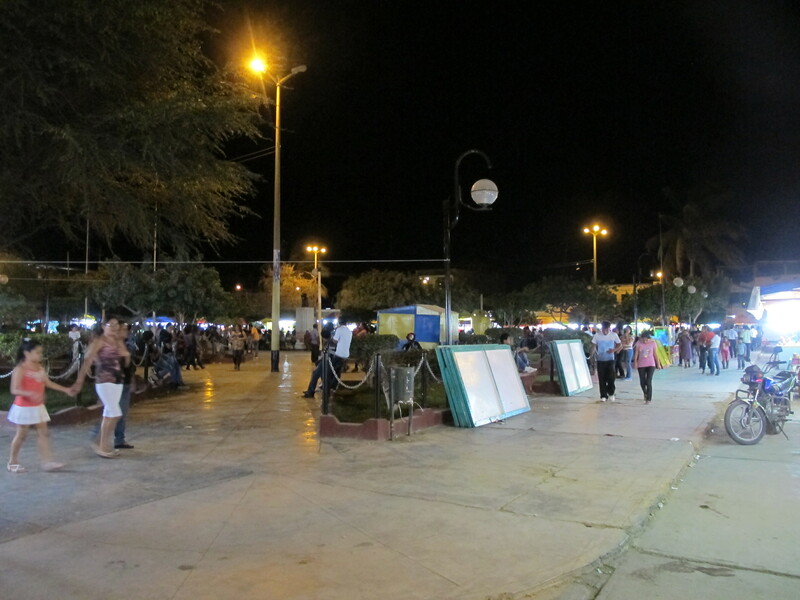 anyways, the feria has started here in tucume. 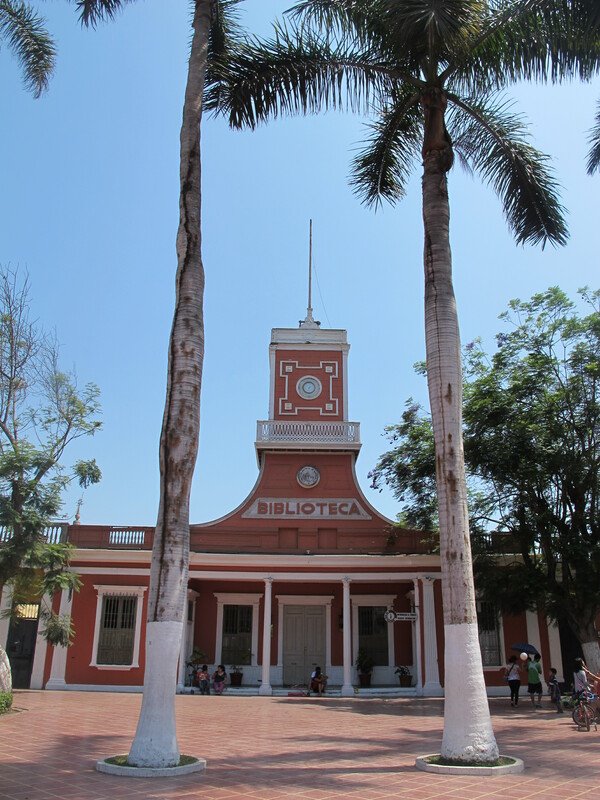 this month it is of the “purisma concepción.” my town has been talking to me about since i arrived in site in august. hundreds upon hundreds, if not more, are piling themselves in my small town. many are traveling from lima. family that has long moved away returns for this week. 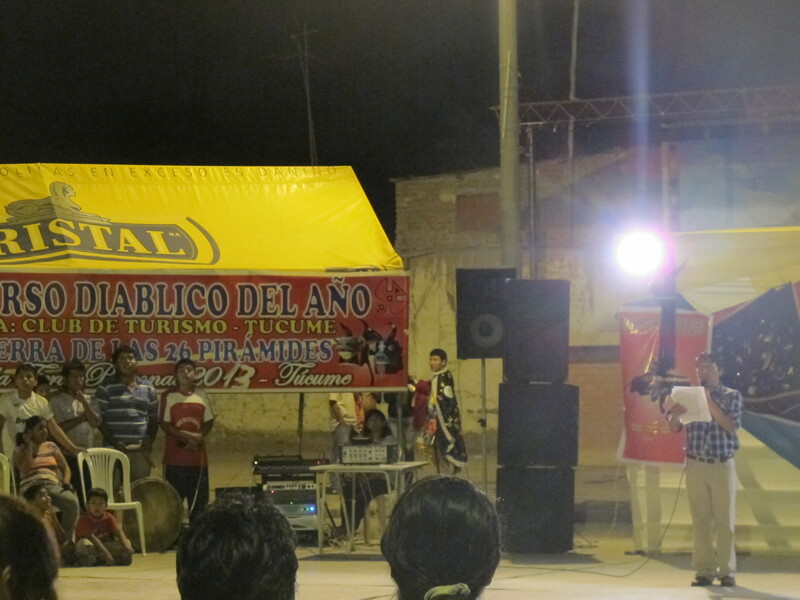 to get the week (more like 2 weeks) started, i attended a danza de los diablicos competition. the history of this form of dance is quite interesting. it’s a traditional dance dating back to the 17th century conveying how the spaniards would try to trick the natives into joining the catholic religion by hiding in the pyramids and coming out at night dressed as the devil. 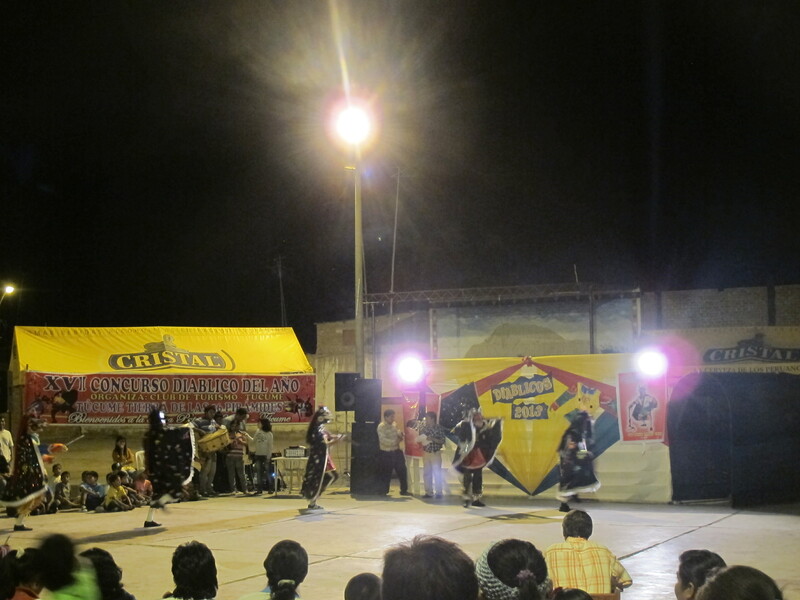 now with the dance, it’s a tucumano folklore to express their world under colonialism, and how the colonists used fear instead of love for conversion. the promenade of the contestants. stayed tuned…a number of other cultural events will be happening over the next couple of weeks that have to do with this feria! hello all. just a brief note and break from the previous “musings & ramblings.” i am quite delighted that i wrote the last post, because just as how this is the case with everything else in my life, when i start to outwardly state one thing, the opposite begins to occur. i filled in a little of the free time with boogie boarding and swimming at a nearby pool with my family. but all of my other hours have been fairly full. between church, young women, vacacciones utiles prep, and the upcoming ferria, i have been quite busy. it’s been a delight. so much so that friday night resulted in my going to sleep at 9:30pm…however, i did have a solid night’s sleep that night…which is a rarity now. unfortunately with this heat, i find myself waking up in the middle of the night dehydrated and also needing to go to the bathroom because of the 1/2 liter of water i drank before going to sleep. i intend to FINALLY breakdown and buy a fan. i found a nice, tall one for only 50 soles. unfortunately i failed to bring my market bag this week. next week though…NEXT WEEK! in other unrelated news: i attended a regional conference about job fair offerings and services which will be great for when i do put together a job fair for my town in the future…it also included swag bags with a t-shirt and awesome pen (obvs, it’s all about the little things here). also, i found a restaurant with a/c and salads! yesterday i dined on tacos and celebrated a friend’s birthday with her family, and attended a small business opening of another volunteer. so i have found quite that work/life balance in site. however, tomorrow is my first day of my VU programs…and i think this is when the balance starts leaning toward the work side.! but i am more than excited. this one is my environment group with the museum. so there is a lot of hiking and recycling and recycling art projects. WOOHOO! with that. it is time to catch a taxi. return to a land of limited speed internet. zero breeze. and lots of sweat. and i now bid you all adieu. ps. yesterday, i drank 4.5 liters of water…and i still felt dehydrated…what is it with this heat??!?! well. here we are. 9 pm on a thursday night. i was talking to my dad last night, and he suggested that since this blog is to express the experiences of my time in the peace corps that i should write about it. so…HERE WE GO! i guess to skip all the build up, as really i have become more and more blunt during my service, namely because i can’t talk all rico suave in spanish…this has started to limit my english as well…but to get us back on track, i am/was/almost out of a little rut in my service. you know, during training they shared with us, multiple times, a handy graph with quite the squiggly, curvaceous line drawn across it that showed how the emotions of the volunteer can fluctuate during your 27 months in country…and about what time you experience these, and according to the graph, this one is right on time. honestly, i wouldn’t even say that the line on my graph has been as squiggly as the one they showed us in training, but i wouldn’t say that i am at a high point at the current moment. now, before you all start calling me and sending me tons of care packages (which i am more than okay with), i am emotionally okay. i am not sad. i am not depressed. in fact, i am pretty happy. i am just in an in between hump (or rut). i came back to site from an incredible vacation, and i returned to blazing heat and few weeks to kill before i start my summer programs. in my site, during the month of january, everyone is out planting the rice and/or traveling to lima to cool off, so my socios urged that we start our programs the last week of january. well, they are going to be awesome because i have been preparing away for them…maybe over preparing now. to help fill the time, i wanted to start my world map project and have that completed with the kids who are still hanging around town. however, my municipality is having me wait because they are going to repaint the wall that i want to use…hopefully this is sooner rather than later. i am also working on making some concrete plans for my next year of work and procrastinating on my final touches of my community diagnostic (it’s like a cockroach…it never dies…) and working with a group in town on trying to start some cultural workshops…but this has started to go from a collaborative project to me pushing and begging for us to meet to finalize details. anyways, the truth of the matter is, no matter what, i have about one more week before my programs start, and honestly, i hate not being busy and it’s my job to get me out of this. i found myself watching too much of the oc…such good television…and not being able to settle on reading just one book…and having terrible nights of sleep….mainly because it is just too hot. i can’t open the window at night due to bugs (i have a mosquito net…), and i also have to worry about rats entering my room through the window as well…so, closed it stays. so, if this is my job to get me out of this, what does one do? : well, to start with, i thought i would try to start some semblance of a routine. i mean, really, when else in my life, am i going to have the hours where i can leisurely include: studying my scriptures (english & spanish), studying my spanish, exercise, yoga, napping, and whatever else i would like to include and still have plenty of time to go out and do work…and maybe catch an episode of the oc….so really, i am kind of lucky…before my service, i was always a go-go-go person, and filled my schedule with things for all hours of the day. another thing i have done is created a list of small projects i wanted to around my house for my family: make a solar oven (put this heat to some use), create an herb garden for my family (put all the plastic bottles to use), make shrinky dinks with samia in the aforementioned solar oven, and the list continues. earlier this week, i went to the circus with my friend, cinthia, and i think it was my favorite circus experience i have ever had…with the exception being the first time i went as a small child…i still have my souvenir cup from the sno-cone i had. but really, i was a little nervous, namely because it was 2 soles, and at that price, i wasn’t convinced that the animals would be humanely treated…i mean circus animals aren’t even humanely treated in the us…BUT to my delight, there were no animals. just some good ol’ fashioned clown tricks and other fun talents were shared. i will definitely have to go when the next one rolls into town. last week, i taught some kids how to sing adele’s “rolling in the deep,” as some kids wanted to learn the song. i had some time to kill, so it became music class in my house. tonight i took my first cold shower since being in site (i have been using the awesome solar shower ang sent me here with…it’s been a delight). and you know what? it was like heaven. seriously, it has been so hot here that the shower, literally, cooled my body down. it was AMAZING. i can’t wait for the next one. also, while out sanding, i looked down at my leg only to realize that summer really is upon us. not because it is 90 degrees right now without a/c and we are not even in the hottest parts of the heat yet…BUT because i had been outside for only 20 minutes or so and on my left leg between my knee and my ankle i counted 19 new mosquito bites (not including the 4 that were already there)…and the 6 on my right leg. honestly, i don’t know why they went only for my left leg. however, i think calamine lotion is a new look that i am going to own this summer, because i am tearing my legs apart scratching them. today i learned that the “channel up” button no longer exists on the tv, so if you want to change the channel you can only go down. honestly, i don’t know how long it’s been that way…i think this was the first time i turned on the tv since being back in site. speaking of tv, i watched about 10 minutes of “downton abbey” tonight while it was on the british channel…awesome! one more thing about tv, also learned tonight that we now get the byu-tv channel…which is funny. one thing you should now about the cable here, is that i think all of the local tv’s are linked to some master tv and some guy decides what channels we will get because they are constantly changing…anyways, awesome that we get byu-tv because i got about 10 minutes of the byu basketball game tonight…so hopefully this channel is still around when it’s football season. and then i was over watching tv. OH and i can’t believe i almost forgot…i live 90 minutes from the ocean…so, you better believe i bought a boogie board!!! 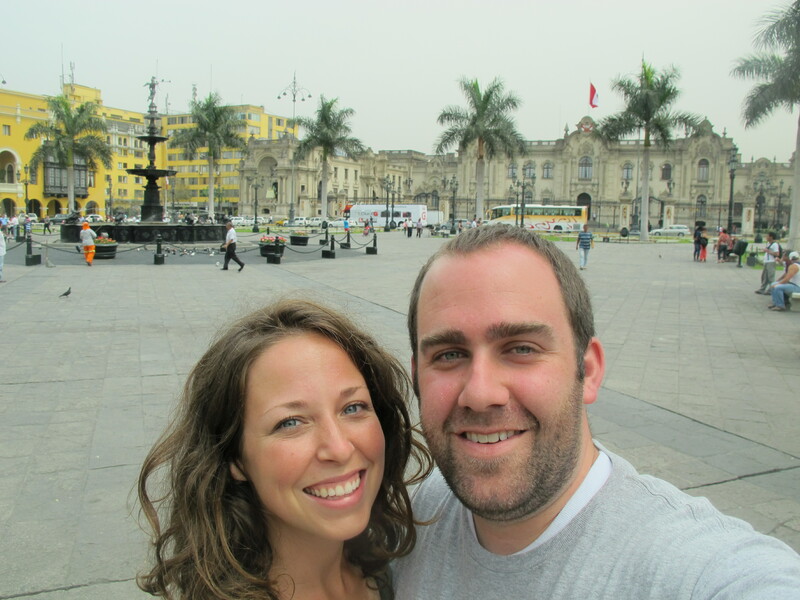 despite the altitude sickness we still had a blast traveling around peru, and trying all sorts of new and delicious food and seeing incredible sites throughout the country. it was such a treat to be able to share my life, my site, my community, my family with mp, and now there is someone else back home who knows what i am talking about when i talk about the ants in my bed, the pig outside my window and how much samia has grown. 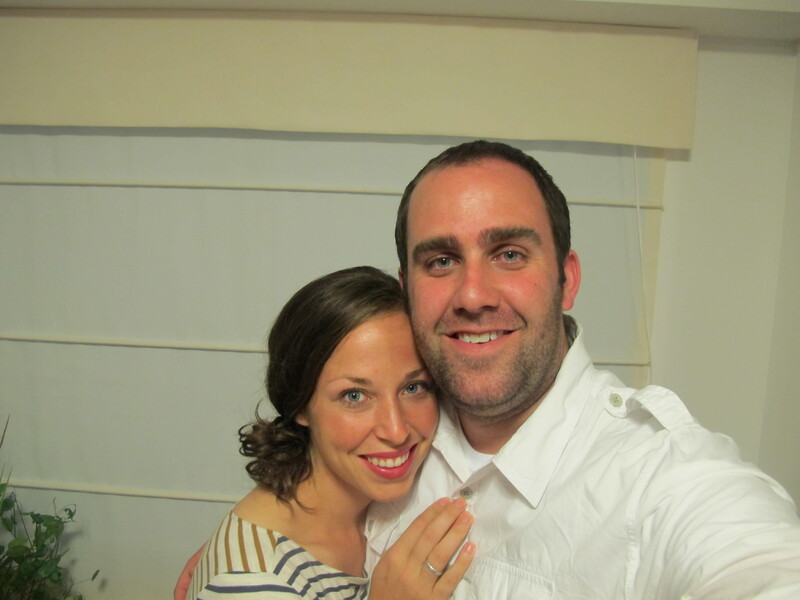 for our last night together, we had a grand finale of some sorts. we dined at the world-renowned astrid y gaston, listed as one of the top 50 restaurants in the world…and goodness it was worth all the hype. it has been almost 4 days since we have eaten there and i am still full. the flavors there were incredible and they really did take peruvian cuisine up a number of levels…which i, honestly, didn’t think was possible. 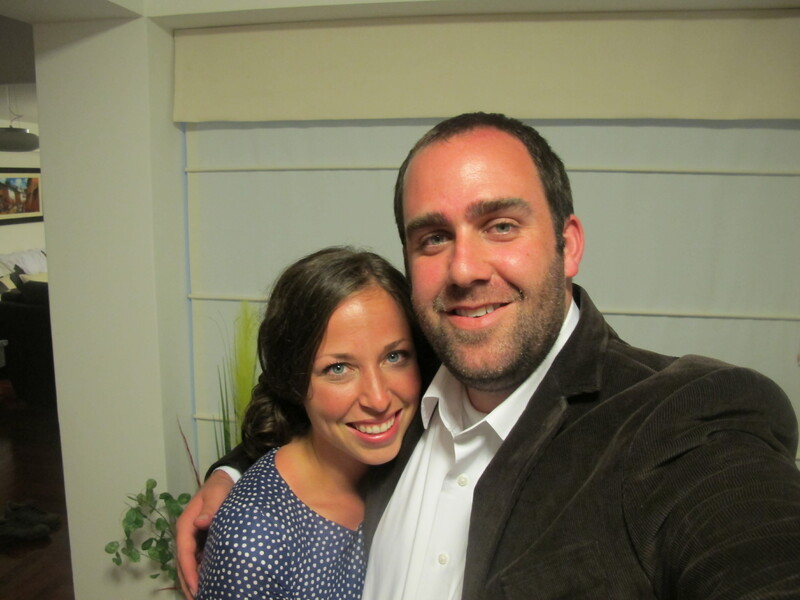 plus, it was just fun to spend a nice quiet evening together before we said goodbyes at the airport. also. just a short 3.5 months until i make my way back to the states for a quick visit to mp. considering that it had been 6.5 months previously, this should go faster than lightening…i hope! 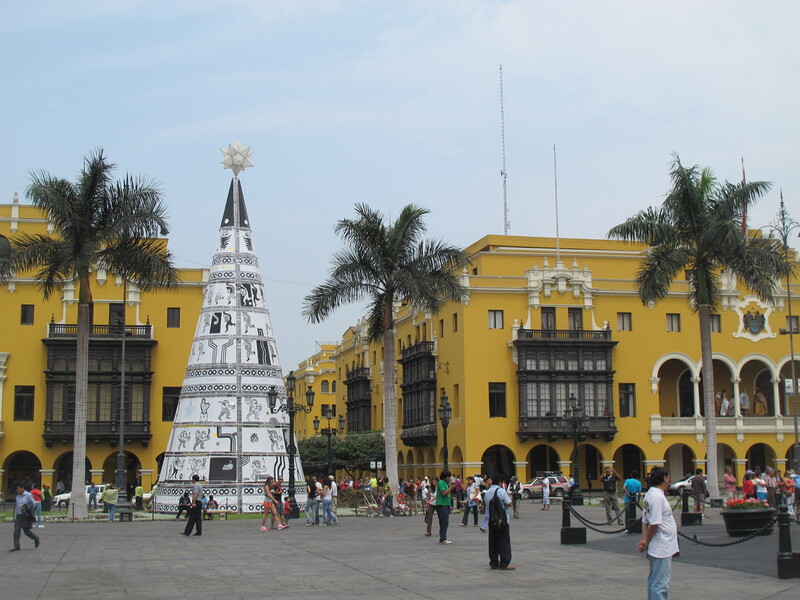 in the plaza mayor in lima. during my 2.5 months of training, i never went to lima all that often. 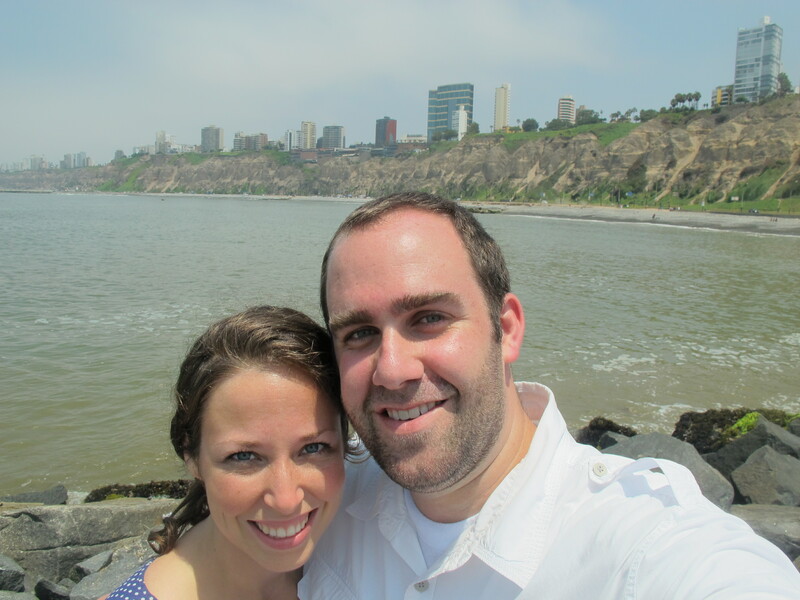 i was, generally, too preoccupied in integrating with my family in order to increase my language proficiency, so having a few days in lima with mp was perfect. we went to the main plaza as well as visited the catacombs, which really gave me the heebyjeebies, but so much fun at the same time. i definitely recommend this stop while exploring central lima! only smiles in the plaza mayor. 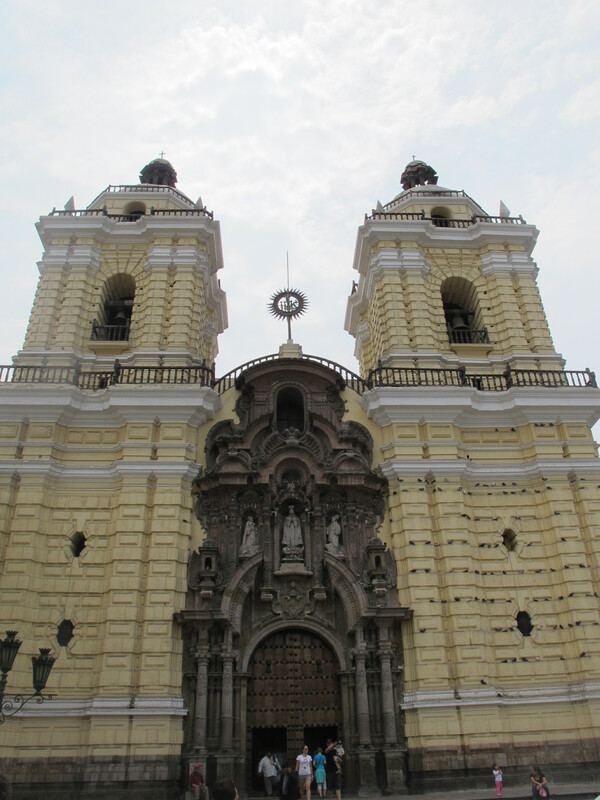 the cathedral of san francisco, where the entrance to the catacombs is located. 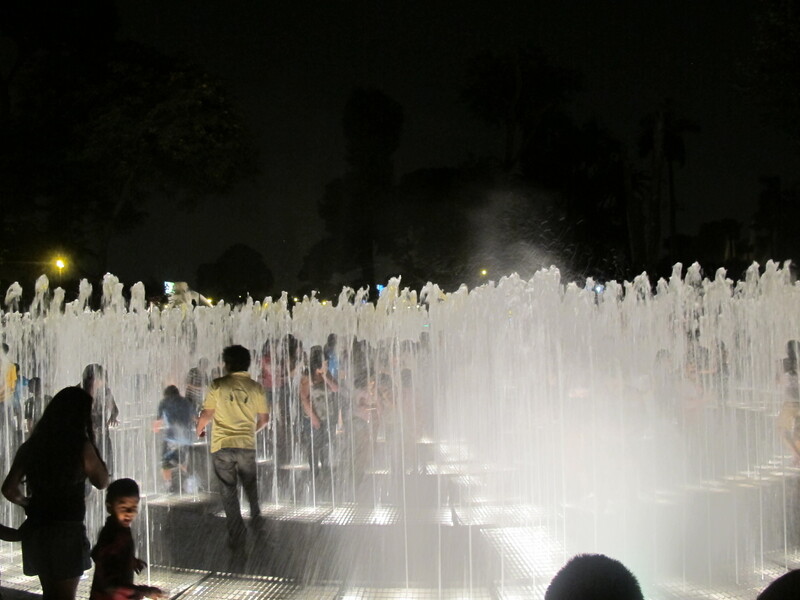 earlier in the day we visited my family in lima, and they gave us the best recommendation we received all week: parque de las reservas. 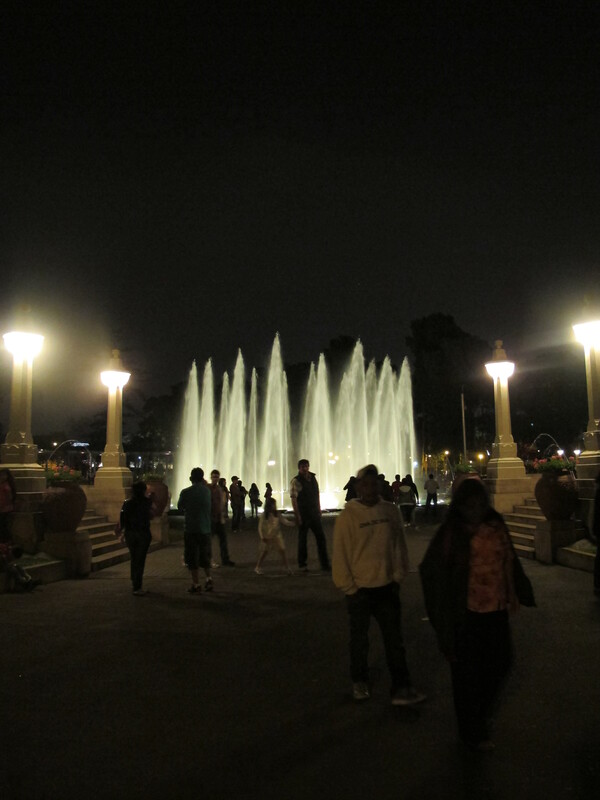 at night they have a giant water show, and the park is filled with numerous other fountains with light and music and interesting structures. it was so much fun! 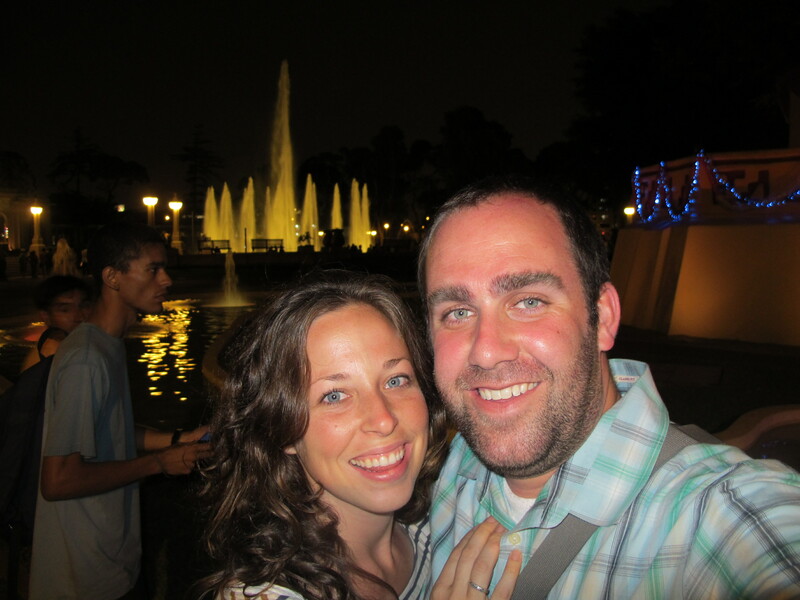 however, i would say that we left wishing that we had worn our swimsuits, as it was so tempting to run and play in all the fountains as well. 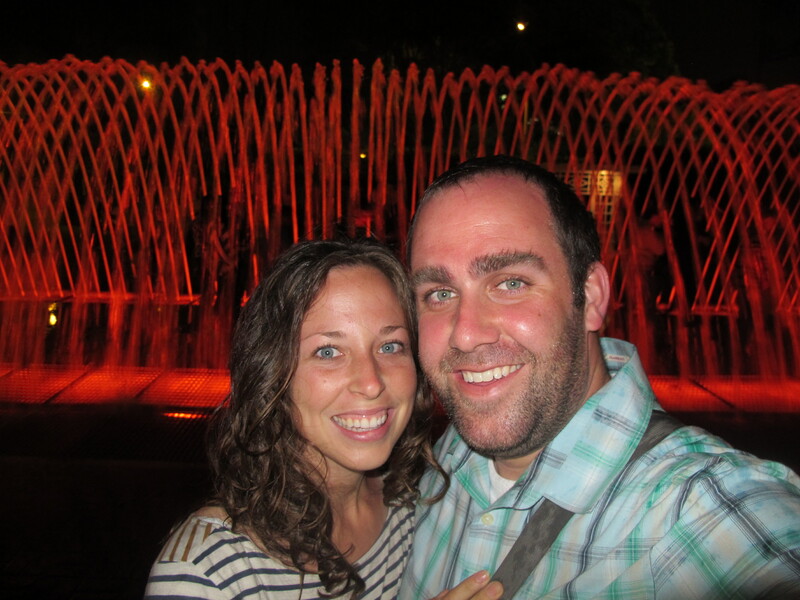 we were soaked after running through the fountain tunnel behind us. 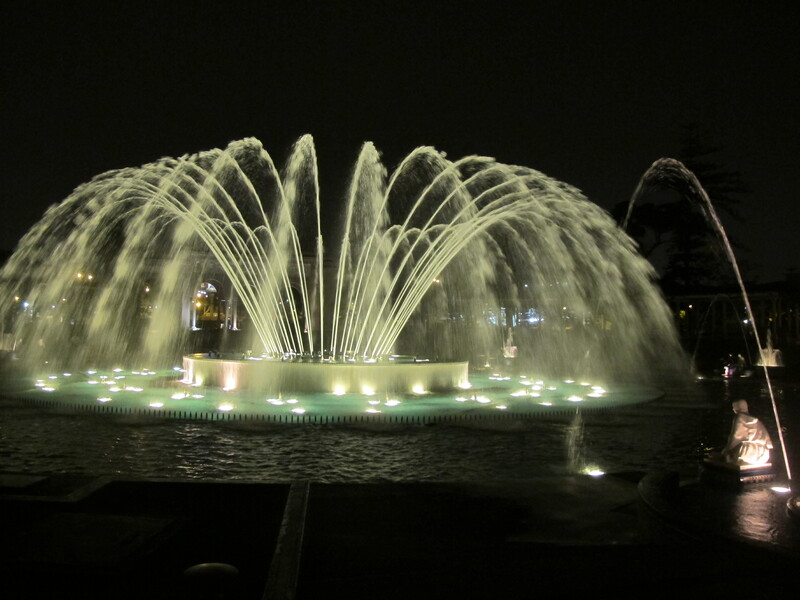 if you ever have a free evening in lima, i highly recommend this. it is only 4 soles to enter and is located next to the national stadium. it is so much fun and will bring out the kid in you! the streets were lined with old houses that made me feel like i was in the old-timey french quarter of new orleans. 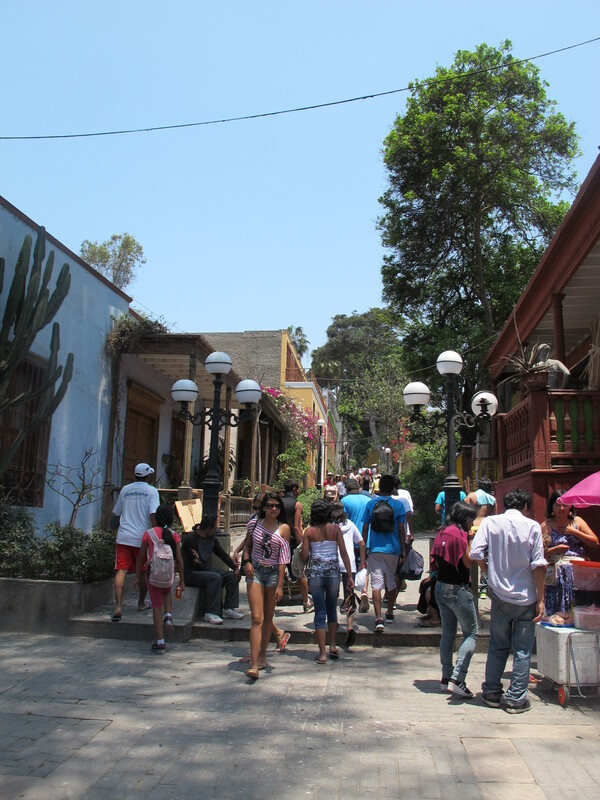 while walking along the beach, we made our way over to the neighboring district of barranco. it’s known for it’s architecture, as it was the home of many of the french and italian immigrants. now it is just full of ceviche restaurants and to a more relaxed bohemian feel than the rest of of its neighbors. 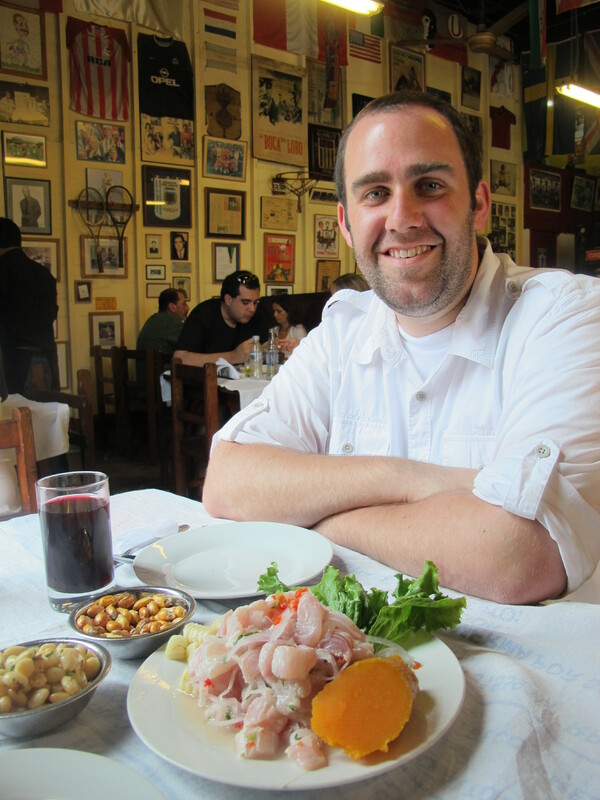 we grabbed some ceviche at canta rana, which had the best ceviche i have ever had. the atmosphere of the restaurant was a delightful change of pace as well. i loved the delightful little library in the town plaza. 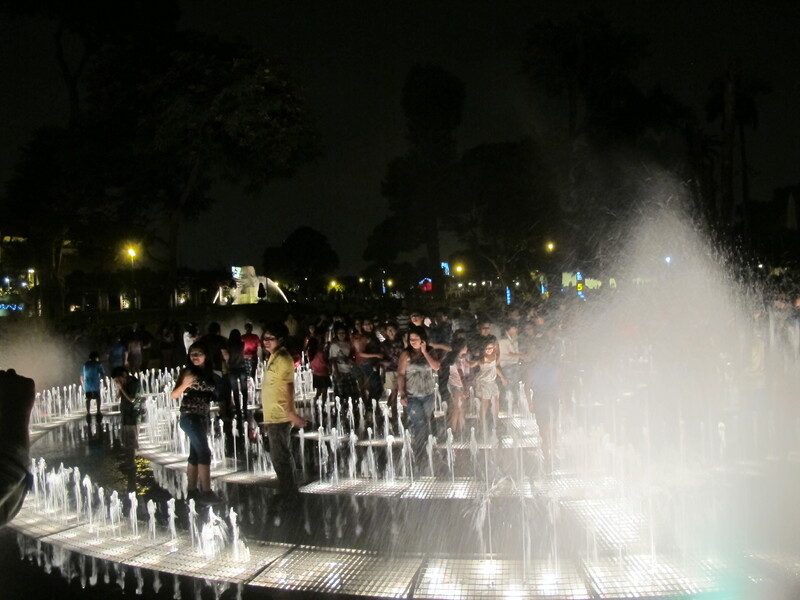 at the nearby parque kennedy. 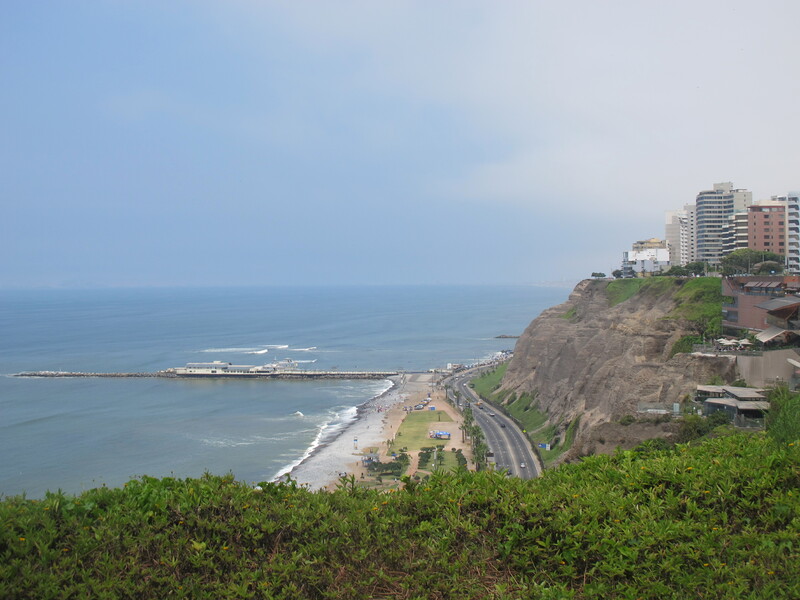 while in miraflores, we stayed in a condo just 2 blocks away from parque kennedy and only a 15 minute walk to the beach. we frequented both locations quite a bit during our last leg of the trip. getting ready for our night out. 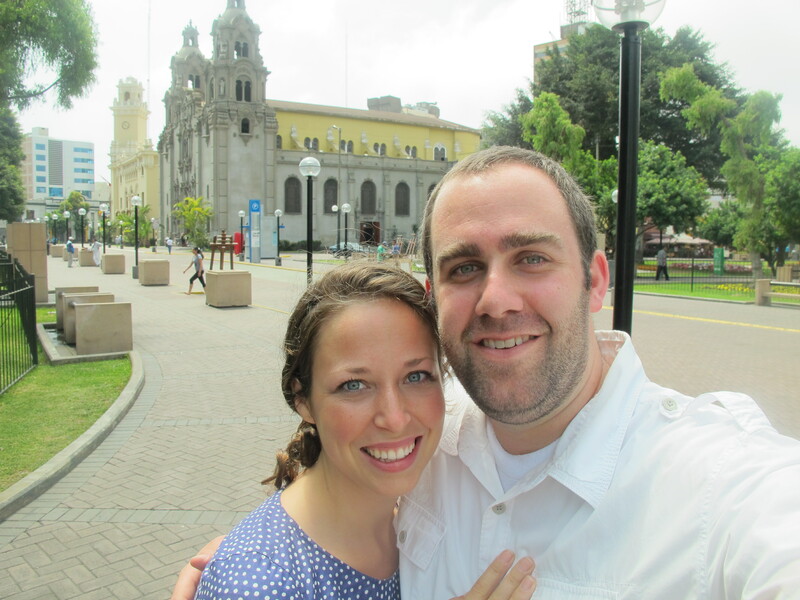 we arrived in lima, miraflores to be exact, on new years eve. peruvians have all sorts of traditions for new years. first of all, everyone wears yellow (we obviously dropped the ball on this one, as noted above), and that especially includes yellow underwear…stands selling the garments littered the streets. at midnight there’s a lot of fireworks and many eat 12 grapes for good luck and run around the town fountain (sometimes with suitcases) in order to bring great travels in the new year. in my site, many people had miniature dolls that they burned in the middle of the street signifying leaving the old behind in 2012 and becoming anew in 2013. having it be that we were in lima, we just stuck with the grapes and the fireworks…but it was still a lot of fun. 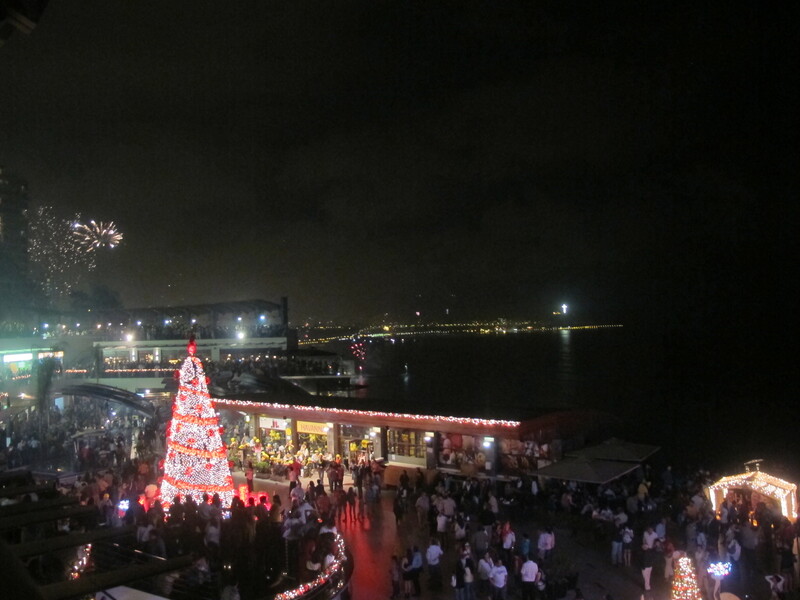 in fact, i woke up at 5:30 am to all of lima still celebrating! 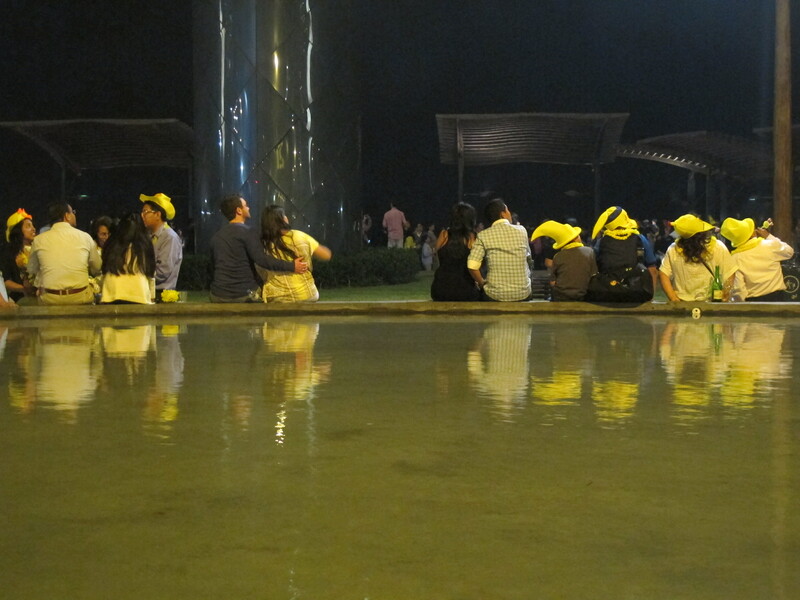 some of the crowd sporting their yellow. just after it struck midnight! i can’t believe it is 2013 already. this picture really doesn’t do the fireworks justice. 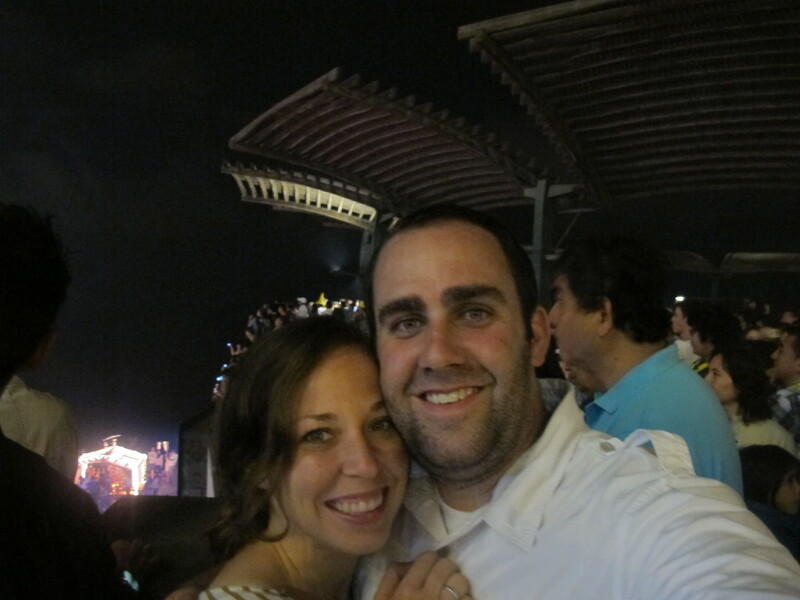 not only could we see fireworks along he coastline, but they were happening right behind us too. so much so, that it was hard to watch without getting debris in our eyes, but still so much fun!